If you’re thinking about opening a new coffee shop this summer, you should really make sure you’re fully prepared for all the various aspects of the coffee business. You can’t just pour a hot cup of coffee and expect your business to take off. You have to spend some time thinking of every single detail of running a successful coffee company. Here are a few frequently asked questions that will hopefully prepare you for a great year of coffee selling. Should I sell only traditional coffee? The coffee market is a very lucrative industry in the United States. The overall retail value of coffee in the U.S. is about $48 billion. Of that $48 billion, more than half (55%) is comprised entirely off the sales of specialty coffee. Although you might do fine selling just traditional coffee flavors, there is a chance your store will never succeed if you don’t provide your customers with high quality specialty flavors. What coffee related items will I need? A common mistake that coffee shop owners make is forgetting to purchase necessary items. Make sure that you purchase plenty of coffee cups (paper cups are a great option), coffee lids, stirrers and straws, sleeves, and anything else that coffee drinkers might expect to see. When can I expect the most people to come into my shop? 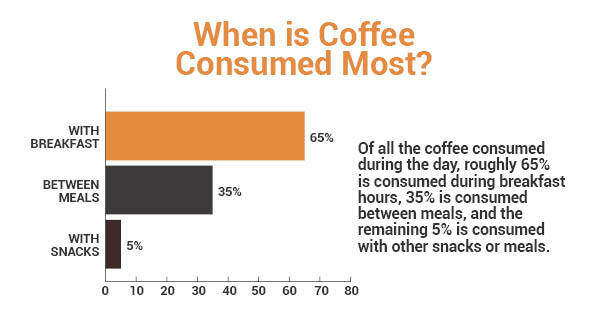 Of all the coffee consumed during the day, roughly 65% is consumed during breakfast hours, 35% is consumed between meals, and the remaining 5% is consumed with other snacks or meals. Make sure that you are prepared to serve coffee at all hours of the day, but really focus on the early morning hours. Should I serve anything other than coffee? A great way to take your coffee shop to the next level is provide your customers with a few different options. Although they will primarily be visiting your business to get a coffee, giving them a little snack can be great. Americans consume more than 10 billion bowls of hot soup each year and you can capitalize on that fact by offering small soup cups and bowls to your customers. How should I setup the shop environment? That’s kind of up to you. If you want to have a comfortable coffee shop with nice couches and seating all over, go for it. But if you’d rather just have a quick shop to get as many customers in and out as quickly as possible, that will work, too. To learn more about what it takes to run a successful coffee shop, contact the Hot Cup Factory today.